Want to slip your way to a slimmer stomach? With the perfect blender, you can have the ultimate tool for crafting weight-loss recipes that slim your stomach, and satisfy your taste buds. The answer is all about finding the right blender. Finding the right blender to make smoothies, soups, and purees can make all the difference when it comes to getting the best mix of vitamins, minerals, and flavors. Here, we're not going to waste your time with boring sub-standard tech. 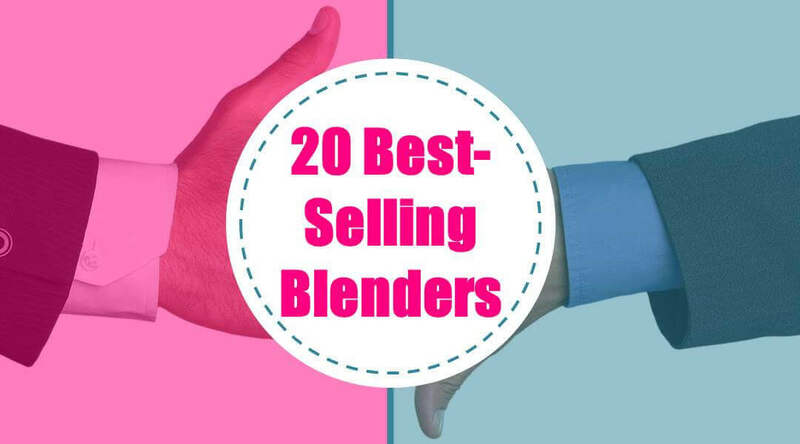 We're going to jump straight in to the high-tech professional-grade solutions: Blendtec vs Vitamix , and show you are 20 top picks for best-selling blenders. Keep reading to find out which one you should choose. For blending enthusiasts, there are few options more appealing than Vitamix juicers. These heavy-duty blenders are not only made to last - they also perform exceptionally well too - helping to make ultra-smooth mixes from a variety of fruits and vegetables. Though there are plenty of great blenders on the market, such as simple bullet blenders, and ninja blenders, Vitamix and Blendtec often come with some of the highest ratings, for those in search of a professional result. If you're looking for power and performance, and you can't afford to compromise, then Vitamix blenders will not disappoint. To help you make your choice, we'll cover just 10 of the most popular Vitamix solutions to compare on the market today. The Vitamix Professional Series 750 blenders are well known for being attractive, and versatile. These are blenders which look stunning on your kitchen counter, but also help to produce professional-grade mixes too if you're interested in a blender to make smoothies, soups, and sauces. This particular Vitamix offer includes a cookbook to help inspire your healthy eating and masterpiece cooking options, as well as a 64oz container with enough space to blend, grind, puree, and chop for the entire family. The canister is BPA free, and it's been specially designed to be adept at creating frozen desserts like sorbets, as well as comforting home foods like salsa too! Thanks to the two-part lid design, you can even throw in extra ingredients while you're blending if you're suddenly hit by inspiration. I've found this feature particularly useful when I'm rushing around trying to prepare dinner and often forget a couple of items along the way. Sophisticated and professional in appearance, this blender is the perfect solution for budding chefs or people who love to spend time in the kitchen. Thanks to its efficient motor, the Vitamix 5200 series blender can power through large chunks of fruit, ice, and vegetables without a problem. You can adjust the speed according to your needs, and I find that the 64-ounce container also makes it easier to blend larger batches of food if I want to serve the whole family. One particularly exciting feature I've noticed about the 5200 series is that it's capable of breaking apart even the tiniest seeds to develop an even and smooth texture - making it the perfect blender for smoothie enthusiasts. T﻿he Vitamix 5300 b﻿lender offers a quieter blend than some of the other options on this list, which means that it's perfect if you want to avoid the headache-inducing noise that often comes with blenders. The 64-ounce container fits perfectly under most kitchen cabinets, and it's ideal for whipping up a restaurant-style meal in no time. Thanks to a 2.2 horsepower motor, you can blitz through the toughest ingredients in no time to create everything from smooth and creamy desserts to delicious soups and smoothies. What's more, if like me you hate the idea of cleaning up after you blend, you'll appreciate just how simple this blender is to clean. Just add some warm water and a drop of dish soap, then run the blender for 30 seconds on high. If you're tired of blenders that don't look the part, this stunning brushed steel version of the Vitamix Professional Series 750 could be the perfect solution. It includes four pre-programmed settings so that you can choose and blend everything from frozen desserts to hot soups in seconds. On top of that, there's an additional program for self-cleaning. Another benefit? The 2.2 horsepower motor doesn't make this an extra-loud blender either. The innovative use of sound-managing technology in the Vitamix helps to ensure that you get one of the most peaceful experiences in the Vitamix lineup. If you're looking for the best blender to make smoothies, then the Vitamix 7500 might be the end of your search. This powerful and attractive blender not only stands out thanks to its 64-ounce container, but also it's incredible 2.2 HP motor, capable of cutting through almost anything. The Vitamix 7500 includes a handy pulse feature which is perfect for chunky soups and salsas, and there's a range of 10 variable speed options to select, which means that you can create a vast range of different food experiences with one neat blender. The bottom line? If you like power and detest noisy blenders, then this is the right choice for you. One of the more innovative blenders in the Vitamix lineup today, the 780 is the first model to come with fantastic touchscreen controls. Belonging to the G-Series offered by Vitamix, this exciting new control configuration makes a fresh change from the old dial setup found on most household models. The 780 is a great next-generation tool that combines new controls with a sleek design to deliver a fully engaging blending experience. If, like me, you're not particularly tidy in the kitchen, you'll be pleased to know that the 780's touchscreen controls cannot be activated by spills and splashes. Many consider the Vitamix 1732 TurboBlend to be one of the most innovative blenders on the market today. Not only does it come with a powerful 2-peak horsepower motor that can move blades at a speed of up to 240mph, but it's also incredibly easy to use. This delightfully professional-looking blender comes with a huge 64-ounce capacity container that can be used to quickly process plenty of whole food soups, smoothies, and frozen desserts. No need to worry about protecting your blender from kids that race around the kitchen either, as the container is totally shatter-proof! All of that, and and it comes with a fresh recipe book and DVD too! A slightly more budget-friendly solution for those in search of professional-grade blenders, the Vitamix 1782 T﻿urboBlend 2-speed offers many of the essential features included in its pricier counterparts, without the extra cost. Besides the two peak horsepower motor that's perfect for crunching, creaming, and blending a range of different ingredients, this machine also features a 64-ounce container and a simple self-cleaning solution too! Processing heavy mixtures like frozen desserts is also made easy with the patented tamper tool! Easily one of the most advanced, yet affordable models in the Vita-Mix S-Series, The S55 Stainless blender looks and acts the part of a professional blender, without the huge price tag. The machine features four nifty pre-programmed settings, as well as dishwasher safe parts which are perfect for when you're in a rush! You get two blending containers to choose from, including a 40-ounce container for bigger blends, and a fantastic 20-ounce travel cup that I frequently use for trips to the gym. This model also comes with a safety interlocking system to make sure that you don't have any kitchen disasters. Finally, this blender was probably the one that appealed to me most when it came to buying the perfect kitchen companion. Imagine the tranquility of having a blender that's not only powerful enough to blend just about any ingredient - but also technologically-savvy enough to do it without making a huge amount of noise! The Quiet One by Vitamix has been trusted by coffee shops and cafes across the globe for its groundbreaking silent performance, with more than 93 variable speeds to choose from that give you incredible results at the decibel level of a gentle conversation. As fantastic as Vitamix blenders can be, they're not the only option available for those in search of professional quality. Blendtec blenders are world-renowned for their exceptional performance and speed, and though the lineup can be pricey, if you're looking for the best then Blendtec is a great place to start. The number of features that these models offer is astronomical, and you can use your blender for far more than mixing ingredients. BlendTec models easily create soups, salsas, coffees, and more! Keep reading to see us compare some of our favorites from the BlendTec portfolio. Simple, yet effective, the BlendTec Total Blender is all about offering exceptional performance without any complicated bells and whistles. I personally think that this is one of the best blender for smoothie tools, thanks in part to its 2-quart square container with a secure fitting lid. All you need to do is throw in your favorite ingredients and pour away to enjoy smoothies and mixes with the entire family. This blender is not only quick and easy to use, but it also comes with a brand new 4" precision blade perfect for powering through tougher tasks. If you're looking for a powerful, cost-effective, and impressive certified Blendtec refurbished model, this could be the perfect solution. The Blendtec TB-621-25 Total Blender Classic comes with a wildside+ jar and secure-fitting vented lids for easy mixing. The total blender offers plenty of commercial quality results - without the huge price tag. Thanks to its 1560-watt performance and 3 horsepower direct-drive motor, you can rest assured that you'll walk away with smooth and creamy results every time. Not only is this Blender great for sauces and smoothies, but it can also be used to whip up dressings, cappuccinos, and bread dough too with its precision blade and generously sized container. A straight-forward and easy-to-use blender that combines functionality and practicality to deliver exceptional results every time. The Blendtec Classic 560 Blender with the wildside jar ensures that you have all of the tools you need to craft stunning kitchen experiences, from smoothies to sauces and creamy soups. From the 3 HP strength that helps to deliver truly exceptional performance every time, to the flat push-button interface that's ideal for when you're in a rush, the Blendtec classic is the professional-level kitchen blender that you can use every day - and let's face it - you probably will! The designer series by Blendtec stands out, first and foremost for its good looks. This is the kind of blender that you expect to see in high-end cafes and coffee shops - but it's far more than just a pretty face. Functional, and powerful, I've used this blender to do everything from making bread to grinding coffee and mixing lattes. The innovative touch-slider sensor helps to give you all the control you need over power and speed for an accurate finished result. Just touch an area to select your chosen speed, then slide up and down to fine-tune your performance. I've found that the Blendtec Classic 560 is the perfect solution for many of my blending needs. With 3 HP of strength for cutting through a range of different ingredients and materials, as well as an ultra-high-speed and quiet motor, the Blendtec Classic 560 is easy to use, and it looks the part too. You get a plunger free jar that uses a patented design to reduce the need for a tamper, as well as a unique safety blade that makes sure you won't end up with unwanted cuts when you're trying to clean your machine. All of that and a smart touch-screen interface too - for a minimal price. The powerful Blendtec Designer 625 is a refurbished model with all the value and performance of a brand-new machine. This fantastic Designer tool not only looks exceptional, but it's great at blending even the toughest ingredients too, like frozen fruit and ice. If you're looking for something that's restaurant-standard at a price that's perfect for just about any kitchen, the refurbished Blendtec Classic could be the ideal companion for you. Plus, the touch-screen controls make finding your perfect speed easier than ever! Exactly the performance you would expect from a commercial blender - in the comfort of your own home. The BlendTec Pro 800 is all about exceptional results. Unlike most powerful blenders, this one is fantastically quiet as it's housed within an innovative sound-sealed enclosure. Enjoy the illuminated interface which allows you to craft your own perfect recipes without any hassle, or choose from 6 pre-programmed cycles designed to produce everything from mixed drinks, to frozen treats and hot soups. There are even an 11-speed touch slider and pulse selection that lets you have ultimate control over every aspect of making your favorite foods! Instantly upgrade your kitchen with a bundle designed specifically for blending enthusiasts. Not only do you get a fantastic 1560-watt blender, but you also get the commercial quality performance you've been looking for to enjoy café-level food in your own home. This certified refurbished Blendtec model performs just like a brand-new machine, and it includes a host of fantastic accessories too, including a smoothie maker's bible, measuring spoons, measuring cups, a peeler, and more! Why compromise when you're looking for the best smoothie maker around? This exceptional BlendTec creation comes with a wildside+ jar, and four side jar so that you have everything you need to craft the mixes of your culinary dreams. Not only do you have a stunning professional-grade blender, but you also get access to a pre-programmed smoothie cycle designed to give you excellent smoothies every time. There are a range of program cycles to choose from, and the square-shaped jar ensures excellent blending no matter the ingredients! Last, but not least, you can blitz the night away with the amazing BlendTec Classic 575 featuring an additional wildside+ jar. This is a quiet and commercial-grade blender that makes fantastic smoothies, soups, and ice-creams in instants. Push buttons ensure easy operation, and the 3 HP strength ensures that you'll have no problem carving through the toughest fruits and veggies - even with the safety blade that's designed to make cleaning easier than ever! Which Blender Should You Choose? When you're looking for a commercial-grade blender in your home, few things compete with the performance and skill of these two technology giants. Unfortunately, your choice of Blendtec vs Vitamix will have to rely on your own personal preferences, and what you hope to achieve with your home blending machine. Good luck, and happy blending! Rebekah Carter is a dedicated author and full-time writer with a passion in health, fitness, marketing, and business.